Image processing has a wide range of real-world applications from fruit harvesting to autonomous vehicles and beyond. The aim of this project is to create a MATLAB program that will identify a stop sign in various backgrounds and lighting conditions from static digital images. This processing could then output information to a theoretical autonomous vehicle, heads-up display, or other driver assistance device in the future. The software first uses color processing techniques to isolate relevant color data (red intensity) from the image. A variety of MATLAB Image Processing Toolbox commands are used to threshold, filter, detect edges, and further process the image. Morphological processing algorithms are applied in order to remove non-pertinent data and isolate the stop sign. 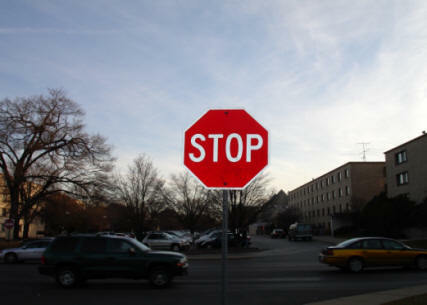 Shape detection is used to determine if a stop sign is present in the current image (if any). Finally, any relevant sign is highlighted and output to the screen.